Pilot Transit Tour was a success! Last weekend, we piloted our Transit Tourism program that organizes fun outings for people looking to learn more about Omaha’s transit system — where it goes and how to use it. We hosted a group of ten participants ranging from small children to retirees. Our first route took the group from Crossroads Mall to the Old Market. The day started cold and rainy, but concluded with a pleasant, sunny fall afternoon. We started the day touring the Czech/Slovak Museum housed in the former Chili’s at Crossroads Mall. In addition to the exhibits of Czech crystalware and accordions, the museum had a large, illustrated history of the Czech people set up in the common area of the Mall. Our first leg of the transit journey began with the walk from the museum to the bus stop. This walk highlighted a number of challenges that transit users encounter. First: how to get from the museum to the sidewalk. There are no obvious or marked pathways for a pedestrian to leave Crossroads. There is a sidewalk that connects to 72nd Street on the east end, but to the south, west and north, there isn’t a clear pathway for pedestrians. Fortunately, Curtis, our guide for the day, knew about a narrow pedestrian ramp that connected the parking lot to the sidewalk on the south side of the mall property. Once on Dodge, as you can see in the photo, the group had to avoid getting drenched by the spray of passing cars driving through a part of the road that was not draining in an efficient manner. This intersection is marked at all four corners by land use designed with a green strip separating the sidewalk from the adjacent commercial property. This form creates a barrier between pedestrians and transit users in the area an their potential destinations. Crossing Dodge Street to the south side (to catch the east-bound bus) we noted that the crosswalk markings had been ground off the street. If the city had not installed stop lines for vehicle lanes there would be no clear delineation of where the cars belong and where people walking belong. One laudable piece of infrastructure at the intersection, however, was the accessible pedestrian signal that provided audible as well as visual cues for people walking across the street. One issue we encountered with fair regularity was that the buses were running about 5 minutes or so behind the published schedule. The good news is that none of the buses, to our knowledge, was early, and the wait gave us the opportunity to get to know one another and answer any questions people had about the bus system and transportation infrastructure in general. Buses running a bit late is not evidence of a system that doesn’t work. Buses operate in traffic and deal with the time delays of passenger loading and unloading. We hope with the development of the ORBT line, some of these issues will be mitigated. The second destination in the tour was the Blackstone District in Midtown. By the time of our arrival, the rain had stopped. 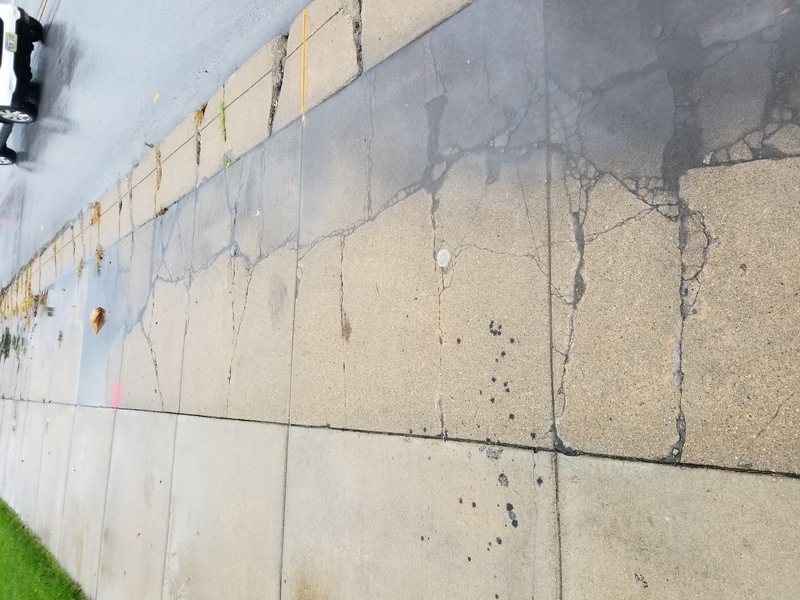 As we walked south along 40th Street to the main drag on Harney, we noted that, though the sidewalk has a generous width, the poor condition of the surface meant that half the sidewalk was covered by standing water. The Blackstone District offered the group a number of options. Small groups split off, one to the creamery and one to the bike shop. Someone grabbed a coffee and someone else sat down with a beer. Next up, we visited Omaha’s Joslyn Art Museum, the iconic pink granite edifice that houses an impressive collection of American, European and contemporary art. Thanks to generous donations from the city’d philanthropic community, admission to the museum is free to everyone, with the exception of special exhibitions. The walk from 24th and Douglas to the Museum one block to the north was sunny and the streets had dried up from the morning’s rain. While walking we couldn’t help notice a feature of the environment that complicates transit use in the area. East of I-480 the city has converted all the roads to high-speed, one way arterials. This means fast moving cars and limited refuge for pedestrians, especially on the east/west roads between the I-480 and 20th Street. The traffic speed on Douglas Street, coupled with over-sized landscaping elements, left little room for people walking and combined to produce a slight unease while waiting for our last east-bound ride. The final stop before returning to Crossroads was Omaha’s Old Market. At this point the group dispersed, everyone confident that they could navigate the route back to the beginning. Some of us did some necessary music shopping while others grabbed a late lunch. In the end, it was a fun day. Participants learned a lot about transit in Omaha and built confidence in their bus riding skills. We will continue to schedule these transit tours. If anyone has specific destinations or routes they would like us to incorporate, please leave your suggestions in the comments. The consistent feature of many of the bus stops we used was garbage. There is a problem with refuse at bus stops, especially bus stops that have a bench. The problem simple, if the solution is not: there are not enough bus stops that have a trash can. The bus does not allow riders to have open food or drink on the bus and the trash receptacles on the bus are more for expired transfers than 32 oz. cups. Of course, the challenge with placing a trash can is answering the question of who will empty the can and how often. Who will pay for the cans and collection? This is an issue we will continue to look into and expect to develop an action around getting better solution for garbage collection at transit stops. Special thanks to Cyndonna Tefft and Ronda Lynne for their photos of the trip and Curtis Bryant for devising the event and testing the route. Thanks for providing this report! I hope there are more! Thanks for the tour. I’m hoping for a North O and South O tour soon! On another note, Keep Omaha Beautiful is hoping to apply for a grant during 2018 to help with placement of trash bins at bus stops and possible servicing done by people who are in the ‘back to work’ track. Trash barrels at 72nd and Dodge St area, plus 72nd and Blondo, 72nd and close to Pine, Dodge at 74th and 75th are serviced by yours truly. KOB also hopes to enlist businesses to adopt bus stop corners / benches. you are doing a fantastic service for the community! please keep it up!